There’s something you should know. I always underbake. On purpose. So today especially as you gaze upon those fudgy underbaked chocolate chip cookie brownies, I’m hoping no one takes offense to the excessive gooeyness. It’s just how I roll. There’s something else you should know. I don’t have much time to write this post today because right as soon as I’m done writing this, I am going to go up to the shelter to enjoy my favorite time of day: playtime. This is an adorable video that Bjork made on his iPhone during a lazy afternoon of play that might help give you an idea of what is currently competing for my time. I might have teared up watching that again, for the hundredth time. What a place of love. Okay, let’s talk dessert real quick. This is the dessert that makes me think of my best friend which equals road trips, college, movie nights, and Mexican food. Totally a natural connection there. Bottom line: we make these all the time. This is also the dessert that should be really easy to make but somehow took me four tries to get it just right. I kid you not: I made this four times, so yes, everyone within a ten mile radius of our house now knows what chocolate chip cookie brownies are. 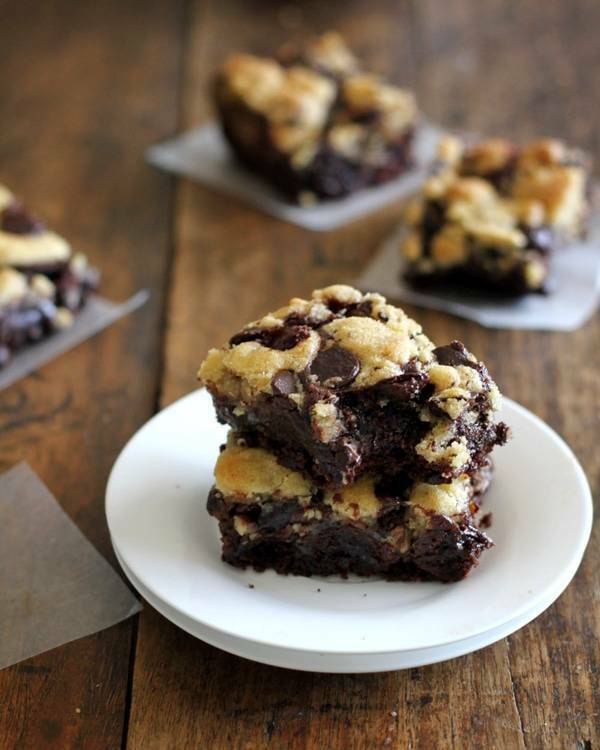 I just want to say a few things about these chocolate chip cookie brownies. 1. 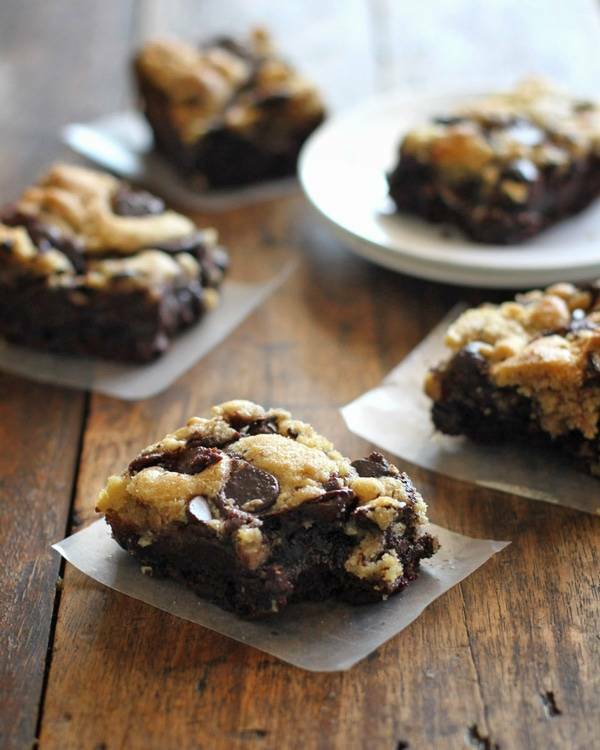 You should make them in a square pan if you like your chocolate chip cookie brownies to be super thick. The first picture in the brown rectangle pan? That was attempt number 1. I hadn’t figured it out quite yet. 2. If you bake them for the right amount of time, they do not sink. 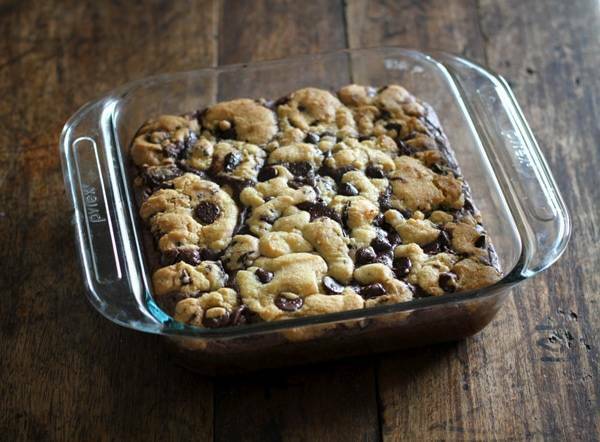 It took me four times to figure that out, but say hello to the un-sunkenness of these cookie brownies. Even and perfect. 3. They might need to be covered with foil while you’re baking them. Yes, like a lasagna. The cookies just wanna get brown so fast, you know what I mean? So cover as necessary. I put some notes in the recipe about that, too. 4. For whatever reason, I just could not get this to work with a brownie recipe that was from scratch. Don’t get me wrong – when I did make them from scratch, they were COMPLETELY delicious. I used this recipe and while I totally loved the recipe, I just couldn’t get it to bake up evenly with the cookies on top. After three recipes from scratch and three sunken cookie brownies, I was done. It’s one hundred bajillion degrees and that is the point where melting chocolate in a double boiler becomes not fun anymore. We always use a brownie mix when we’re making these at my friend’s house anyways, so what the heck. Use whatever you want. 5. While I allow brownie mixes, I don’t allow cookie mixes or pre-done cookie dough. You MUST do these cookies from scratch because this dough will change your life. It takes like, 5 minutes. I should know – I’ve done it way more than four times. 6. MILK. Milk milk milk milk milk. I’m out, you guys. It’s playtime. 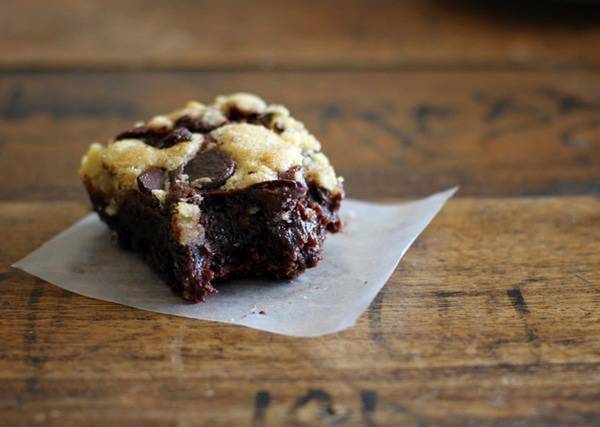 Have a chocolate chip cookie brownie filled weekend! These easy chocolate chip cookie brownies have my very favorite chocolate chip cookie dough baked into the top layer of decadent, fudgy brownies. With an electric mixer, cream butter and sugars in a small mixing bowl. Add vanilla and egg; cream again until smooth. Add the flour, baking soda, and salt. Stir gently until incorporated. Stir in chocolate chips. Store in refrigerator until ready to use. Preheat oven to 350 degrees. Prepare brownie batter as directed. 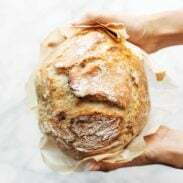 Pour batter into a glass 8×8 or 9×9 baking dish. 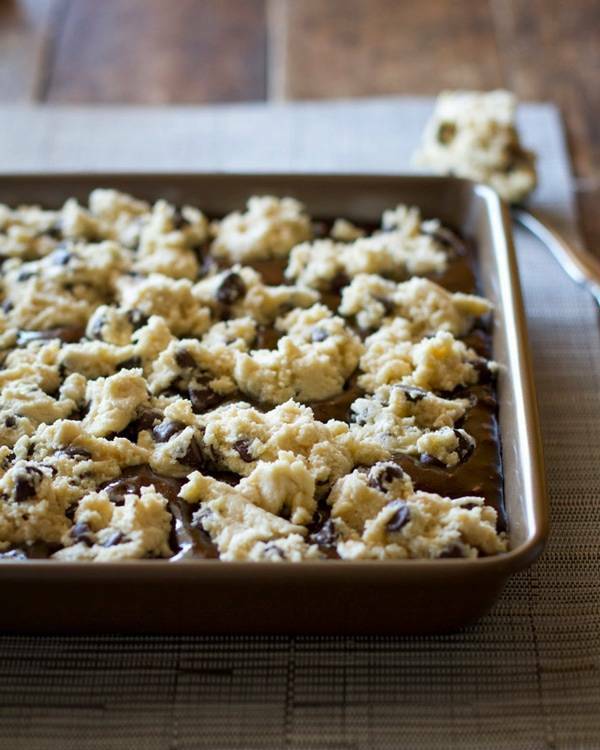 Scatter pieces of cookie dough over the top of the brownie batter. In my 8×8 square pan, I was able to get about 2/3 of the cookie dough to fit over the brownies and I just saved the rest for regular cookies. Press gently on the dough just until it starts to sink down into the batter a little bit. Bake for 35-40 minutes (35 for gooey, 40 or more for fully baked), covering with foil if you need to keep the cookies from getting too brown on top. Let stand for 15-20 minutes and cut into pieces for serving. Beware of taking these out too early because the cookies look brown – usually when I do that, the brownies are still underdone and they sink down in the middle. I found that it was easiest to alternate baking them covered and uncovered. I did the first 20 minutes uncovered, the next 10 minutes covered, and the last 5 minutes uncovered. This allows the brownies to bake without the cookies getting too brown. I’ve also taken foil and just made a cover around the edges so the middle can bake without burning the tops of the edges. I’ve been meaning to make something like these… I have seen them with Reeses cups in the middle (that might be a little overboard on the sugar). Thanks for the tips! I’m so glad you tried four times. So, so glad. 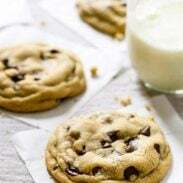 These look like a perfect weekend treat, or after school treat, or company is coming treat. . . . Brownies and chocolate chip cookies – you just combined my kids’ two favorite sweets into one. And I totally agree about under-baking, AND the fact that sometimes boxed brownie mix is the only way it can be done. Oh my goodness, they look so yummy! I’ve made these, not this recipe, back at Christmas for my family get together. They were a big hit! You can go wrong with brownies and chocolate chip cookies, especially together! Will have to try your recipe out soon!!! These look fantastic! The perfect treat. Sometimes it’s hard to make brownies from scratch that even taste as good as a mix. Why go to the trouble if it’s not as good right? Happy Birthday!!! What a great way to celebrate…these are going to get me major wife points!! Those look amazing. If you want to make it a little more unhealthy but add some extra yumminess, you should try adding a layer of oreos in between! I don’t know if you’ve seen them around the web, they’re called slutty brownies, but they are amazing! Love the blog and the work you’re doing. Yep! Seen them and I’ve actually made them but with peanut butter blondies. My photos hardly do it justice – they are SO SO addicting! Love that video, Lindsay – how absolutely ridiculously cute are “your” kids? I wouldn’t want to be missing playtime either. Actually, I think maybe they should institute playtime at my office…. These look like the perfect yummy goodness to indulge in after a long day…one of those things that will make you feel so much better, -life’s pleasurable moments! These look delicious! I can’t wait to bake them for my ladies at the office! omg, these pictures are to die for. I gotta try this this weekend! All I want to do is face plant in these! Gooeyness = love. Underbaking makes the world go round. These look amazing! I can relate about the heat. Its just so hot this summer. (Im in Luzon) I’ve stopped baking for awhile because of it. I saw this recipe at peachesa.com but there was no directions. I’m glad I found this recipe. My kids is going to love these yummy treats. underbaking rules! but oh my gee…these brownies are killing me! I love that yOur food blog has a mission attached to it. Makes it so much more meaningful! Well done with dedicating your life to a bigger purpose. Underbaking is the key to gooey, dessert success! I think these will get made tomorrow for my son’s football team! I am making these RIGHT NOW!. I can’t wait to feed my face with them! These brownies are delicious! Thanks for the recipe!!! Glad you like them Michelle! Um, OKAY. You convinced me! Just pulled these out of the oven. They smell AMAZING. Can’t wait to dig in to one with a scoop of vanilla ice-cream on top. Just one question. I had a little bit of left over dough as well. How long and at what temperature do I bake the extra cookie dough at?